We appreciate the tremendous generosity and support over the past few weeks and the first 9 yards fundraiser! More information on purchasing yard signs will be coming in our next newsletter! Make sure you’re signed up to receive the most current information! You can do that on the contact tab at the top of the website. Your generous donation makes it possible for us to continue the very important work of community outreach in Jefferson County. Jefferson County Public Schools is Colorado’s largest K-12 public school district. 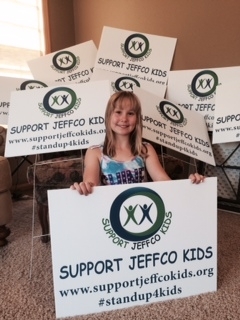 The Jeffco community has over 350,000 voters, and a general population of over 500,000. Congratulations to all of you and a huge thank you!